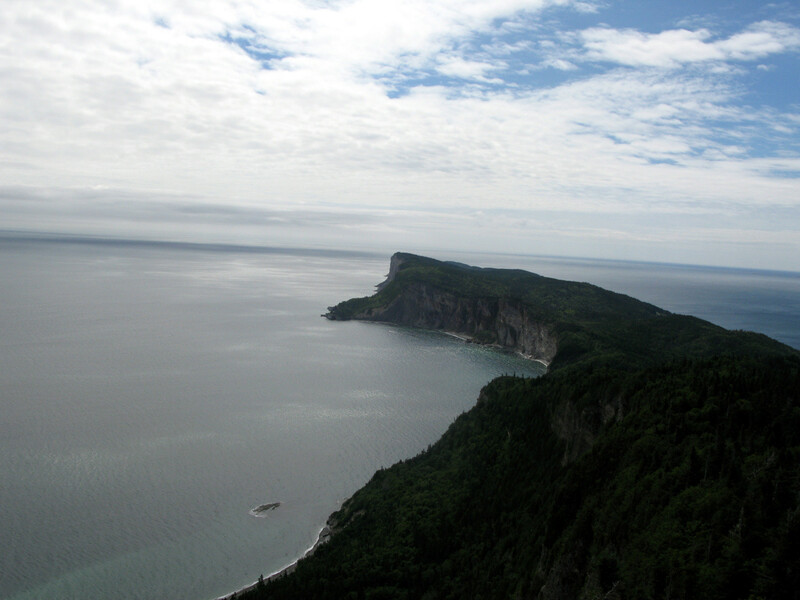 ; 5, at Cap Bon Ami (Parc Forillon, Cap Gaspé), Québec. Bear in mind that these photos weren't spur-of-the-moment snaps. The skilled photographers who took them likely went to great effort to capture them at exactly the right moment, when the weather was dramatic, when the lighting was vivid, and when there were no people around. Any photographer will tell you that a good photo requires timing; they probably had to get up very early, try many times, find precisely the right spot, and spend a long time waiting for the right conditions. The very best photos might have required months of perseverance. You can do the same, but these photos show those places at their very best; don't expect them to be like this all the time. In your original post, the photos you provide were taken during the golden hour of sunrise/sunset, when the lighting is most dramatic. Note how it was taken at the exact moment of sunrise (around 6am, to be specific) with an attractive arrangement of clouds, producing striking colours and contrast. The water is calm, making the lake bed beneath it visible and producing reflections of the treeline above. These things are no accident; it takes skill and patience to get it right like this. Meanwhile, your grandparents' photo of the same scene was taken on a rather dull, overcast day in the afternoon, with choppy water and tourists getting in the way. Moments like the one captured in this photo are ephemeral and often last only for a minute or two before the light changes, so timing is critical. You should also remember that while a camera captures exactly what it sees, the resulting picture is often far from what an observer would actually experience. Your senses as a human being give a far, far richer experience than a camera can ever convey (binaural hearing; smell; touch; temperature; wide-angle, high-definition, binocular HDR vision; not to mention motion), so the photographer has to compensate in some way. 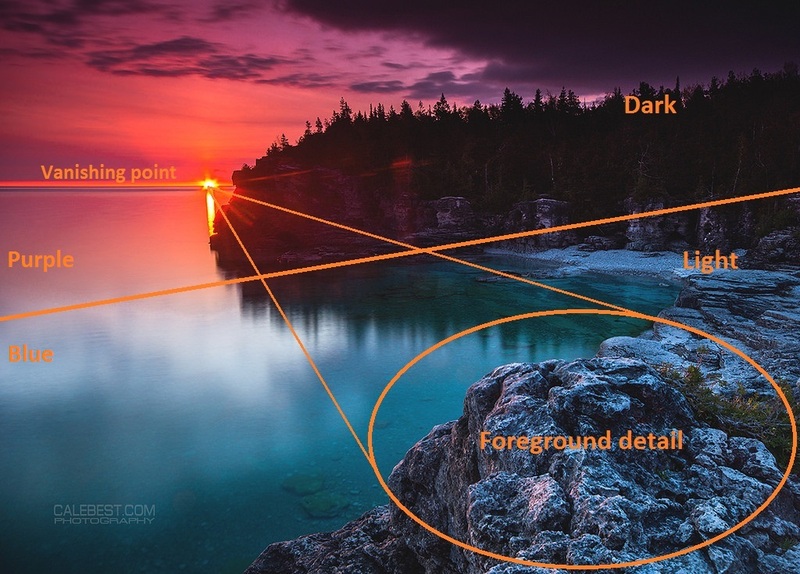 Many aspects of the photo have to be carefully arranged while shooting (composition, lighting, and timing), while judicious post-production is necessary to bring out the full vividness of real life that the camera's sensor just can't capture. For example, this photo benefits from thoughtful composition, with a rock formation providing foreground detail to balance out the distance of the rest of the photo, with the sun providing a vanishing point. The photographer has used a graduated filter (or exposure bracketing) to darken the sky (which would otherwise appear very bright) while keeping the foreground illuminated. Also note how the reflection of the sky on the surface of the water (in the bottom-left quarter of the image) doesn't actually match the crimson hue that we see in the sky itself. This suggests that the photographer has enhanced or adjusted the colours in the sky, perhaps to better reflect what he/she saw and felt when taking the photo – something the camera couldn't do justice to. All of these things go some way to explaining why these photos look so good beside your grandparents' photos. 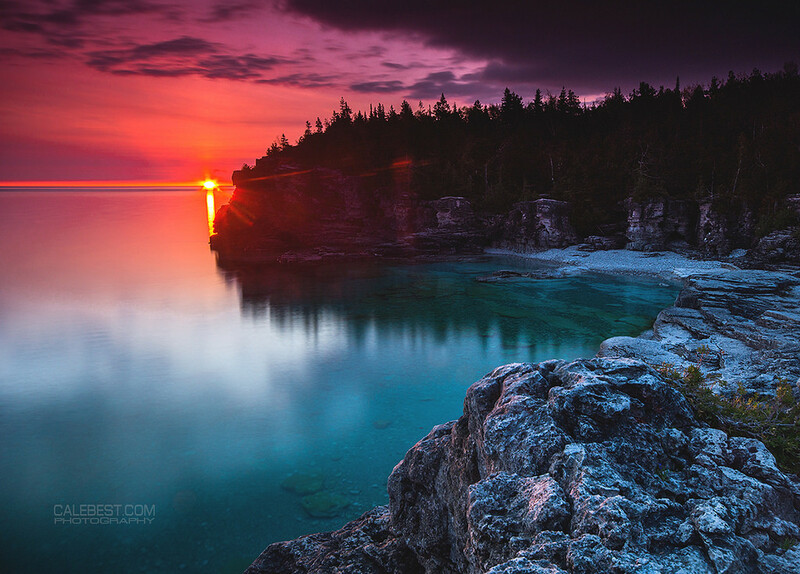 In fact, Kaz has pointed out in the comments that this photo is probably a composite, with the top half (sky, horizon, treeline) shot at sunrise, and the bottom half (water, foreground) likely shot later in the day when the light was softer, for better illumination of the cove and rocks. The best views are the unexpected ones. When are on a hillside and suddenly a gap opens up in the mist through which you glimpse a small lake in the valley down there that you didn't even know existed. Or when you see animals that you only see a few times in your life, and you have a chance to observe them for a minute before they move on. Or when the light and weather happen to be exactly right at that moment to turn a mundane rock or tree into a work of art. If you visit a place of which you've seen a great picture hoping to see the same, you set yourself up for disappointment -- the view won't be unexpected, the light and weather will be different, animals in the picture won't be there now, you suddenly notice all the uglier parts of the place that the photographer left out, and your eyes see things differently anyway. The place is probably famous so there will be more people there, and they weren't in the picture either. Besides you drove ten hours and feel that the view must make up for that or it "wasn't worth it". Photographs are works of art, they aren't reality. Instead, go out on a hike away from roads, enjoy the company, and keep your eyes open, who knows what you'll see. The truly dramatic views will remain rare (or they would cease to be unexpected), so you need to give yourself many chances to see them. And in the meantime there are always animals, flowers, friendly people to spot along the way. Use a different method of picking places to go. A great photo can make an ordinary scene seem extraordinary, so choosing a place based on the best photo will not be a great method. Read travel books or online travel guides. Talk to well-traveled people they know for recommendations. If they are disappointed by the views in person, I would avoid looking at photos beforehand entirely. But if they really want to see photos before they go, just use something like Google Street View, or use an image search and focus on "ordinary" tourist photos rather than exceptional photos. Similarly, travel, at least for me, isn't just about the views, but is also about the experiences you have along the way. Maybe you don't see a "perfect sky" on your trip, but you remember laughing and joking as you went on a hike. Or you remember how the keys got locked in the car (back before cars had sensors to prevent this) and the really weird tow truck driver that eventually came to get it unlocked. Or you remember the strange sensation of driving during an earthquake only to find that your hotel was damaged and you had to check out and move on. Or you remember the fantastic river guide in the Australian rainforest who looked like he just climbed out of five years of living rough in the bush and he turns out to be from Ohio. Or you remember the German train conductor who had a whole long explanation you didn't understand for why the electrical outlet didn't work, so he finally crossed his arms, shouted "kaput!" and walked away. Or you remember the many people you meet along the way, drink with, laugh with, and swap stories with. The journey is its own reward, and the memories of the experiences along the way can mean more than checking a particular vista off the list. One tip though. Many of the more dramatic outdoor photos you see are taken during the Golden Hour around sunrise or sunset, when the sky is full of rich warm light at dramatic angles. Arrange yourself to be there at these times and, weather and atmospheric conditions permitting, you'll see these places in some of their best light too, even discounting all the filters and manipulation that can make photographs more dramatic. Beyond that, they might stop trying to find the most beautiful photographs of every spot in advance and just enjoy the locations for what they are as they find them. Let's be blunt. Someone who feels cheated by reality, perceiving it as bland and wants to instantly perceive it as more vivid has basically this option: take drugs of some sort. On this topic, there exists a recognized disorder called derealization which can have symptoms such as "feeling as though one's environment is lacking in spontaneity, emotional colouring and depth." This means that even vibrantly green hills and vividly blue sky will bore a person who is afflicted with this, because they won't produce the associated emotions. It's about the emotional response to the environment, not the visual aspect of how rich are the colors: does the environment suggest interesting possibilities and are you happy and excited to be there, or is it "meh, whatever". But there really are deep blue skies out there to be seen with the naked eye, and lush greenery, and ruddy sunsets and so on. If you visit beautiful places and are bored, it could point to an emotional weariness: lived too long, been everywhere, seen everything. 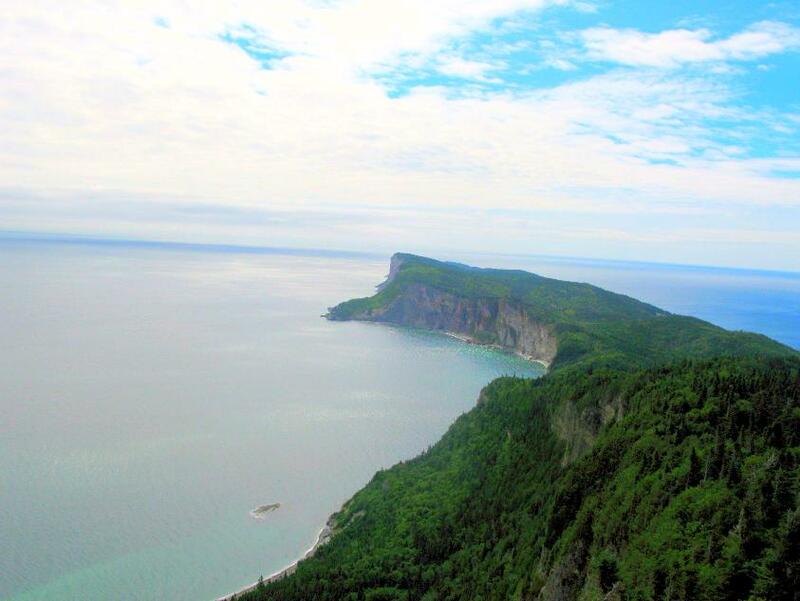 I've been to Awenda Provincial Park (that you cited in your original post, but no longer). If they went there to see the amazing beach, they did the wrong research. 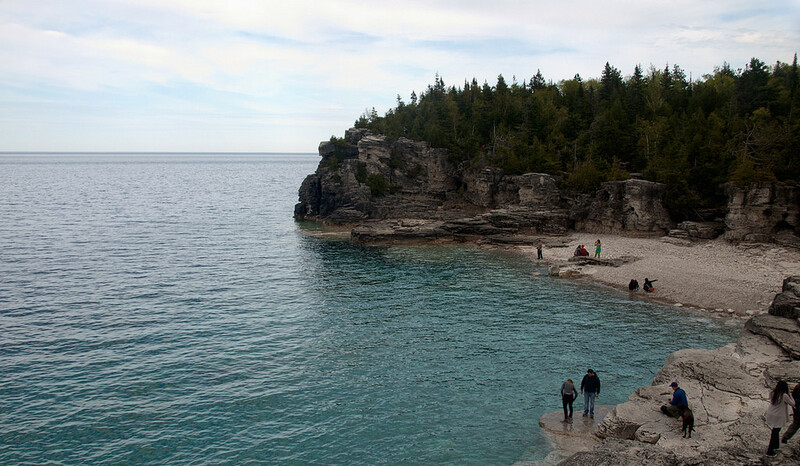 It does provide access to Georgian Bay, which can otherwise be problematic, and it has nice hiking trails, but it's not a magnet destination that brings people from far and wide to see the beach. Being disappointed that it's just a beach, and a pretty stony one at that, is like going to the mall and being disappointed that it's just a bunch of stores. The main attraction to me of being out in nature is the full sensory experience. The silence. Or the sounds of the birds or the waves. The smells - of pine trees, of warm granite in the sun, of flowers, of just-picked blueberries. The feel of the rocks, the sand, the wooden surfaces. The sounds of laughing children running in and out of the water. The smell of someone's BBQ. And yes, once or twice in a day, an amazing sight. Crashing waves or beautiful turning leaves or a lovely flower. A fleeting glimpse of some wildlife. A track on the path left overnight by a deer or a bear. Some of these make great pictures. I've been camping in Ontario - car camping, backcountry camping by canoe - for over 40 years and I get perhaps one or two great pictures from each trip. Some of those moments you just sit and stare and soak them in. But to drive to a picture spot and expect it to be that? Doesn't happen. Venice looks like its pictures (especially in the golden light of late afternoon.) Peggy's Cove looks like its pictures, but is full of tourists. Ditto Niagara Falls, and Vancouver's Stanley Park. The lagoon of Aitutaki looks like its pictures, at least in a few places. The rim of the active volcano on the island of Tanna looks like its pictures, at least the ones that didn't use long exposures and neutral density filters. There are days when quiet backcountry sites in Algonquin and Quetico Provincial Parks look like their pictures. Everything else does not. Photographers are inventing as much as they are capturing. Go to nature for nature, not for the invention someone made there. Photography may be called as painting with light and all images you've provided are art photograps. The angle, timing, exposure, filters and postprocessing are carefully chosen to get the perfect picture not the real one. If you want to see beautiful sceneries, be there during sunset, sunrise, after thunderstorm. Or enjoy what photography cannot deliver - smells, sounds, winds,... - enjoy whatever you can! "To find beauty, you must first look for it." I don't know who said that first and I didn't really understand what it meant until I moved from the city to a stunning location in the country overlooking a lake. I have been looking at my view almost every day for the last twelve years and I still don't get bored of it, but my neighbours, who were brought up there and whose view is even better then mine, grew a large hedge to keep the wind from the lake off their house. They don't see the view, in part because it has always been there and in part because they don't look for it, as a result, they don't see the beauty that is in front of them. If your grandparents are looking for picture postcards, they should go to a postcard shop or an art gallery. I have, on a few occasions, bought the dramatic postcards of places to show other people where I have been and what I have seen better then my own photos can capture, but even the postcards can't match my memories and emotions. You can only view a photo in a narrow window and no depth perception, but the real thing offers 360 degrees experience. Yes they can get weird colouring in photos, I don't know why they do that. Basically you travel to nature to feel it unveiling around you in every direction. Having said that, there's no way to make a photo that captures Iguazú falls even as a fraction of their sheer power. Maybe try them. they still feel deceived by inferior reality compared to ethereal images. according to the Buddha, the problem of suffering goes much deeper. Life is not ideal: it frequently fails to live up to our expectations. And that this problem, and its solutions, are not specific to travelling or to religion (or to Buddhism), and are about managing the disconnect between what you want to happen, vs. what actually does happen. Since you control almost nothing about what actually does happen, the main thing you can control is your mind, the only general answer is "experience what happens as it actually is" instead of "experience what happens through the lens of how you wish it to be". (As for how to achieve that - anyone who convinces the world they have an infallible method for achieving this is apt to become very wealthy indeed - or a laughing stock). On this topic and relevant to travelling are the below quotes from a blog by Maciej Cegłowski (no affiliation of mine) who has travelled quite a lot, including to Eastern Europe and South America - places which are in general less wealthy and less organised than North America or Western Europe, and he has a philosophy for living and travelling of "minimize expectations" which allows him to arrive at ugly, uninspiring, destinations which might otherwise feel like a 'let-down' to someone used to life in a wealthier nation, and still find nice parts and enjoy the experience overall. As with so many things in life, you will get much, much more out of a visit to Warsaw if you take appropriate care to minimize your expectations [emphasis mine] . A backpacker freshly arrived from Prague, Stockholm, or (God forbid) Paris might feel an understandable sense of panic wandering into the raspberry confection we call Okęcie International Airport, or taking the first few slushy steps out of Warsaw Central Station into the ugly building contest we call downtown. But by simply adopting the Polish national motto ("it could always get worse"), the prudent visitor can inoculate himself against all manner of disappointment. And after a couple of donuts, a bus ride or two on the scarily modern new coaches that wish you a happy name day in glowing LEDs, and a few strategically timed glasses of hot spiced wine, Warsaw will start to acquire a happy, rosy glow. 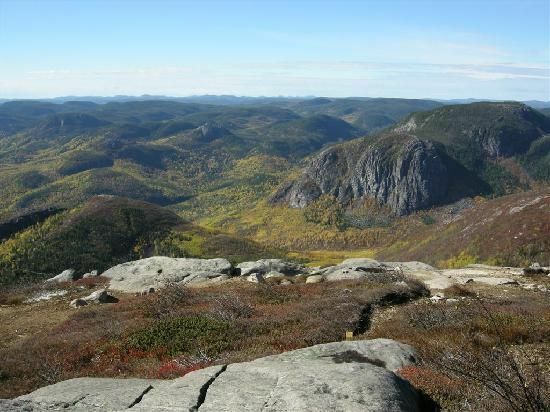 In short, go to Awenda Provincial Park to experience 'Awenda Provincial Park', rather than to fight "Awenda Provincial Park vs. my preconceived notions". Not the answer you're looking for? Browse other questions tagged nature-and-wildlife photography or ask your own question.